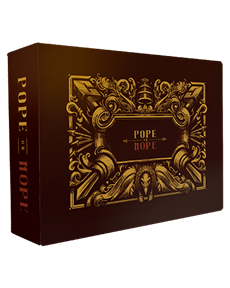 Perform good deeds, sabotage your friends, and become Pope in this fast-paced take-that card game for 2-8 players. His Holiness Pope Peter II lies on his deathbed. You are among the few Cardinals he trusts to serve as his successor, but you have to earn it by performing good deeds. To complicate things, the other Cardinals won't go down without a fight; they'll do everything they can to sabotage your every move. Pay them back in kind. You may also support Kickstarter Campaign of the game!